13. 12 Silben für N.N. A duo for violin and double bass? Even musician friends can hardly hide their reaction of surprise and slight amusement when hearing about our instrumental constellation. However, how many violin and piano duos can boast so many pieces written specially for them? 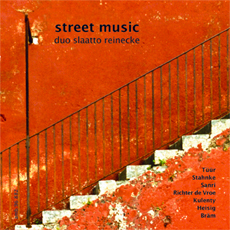 The works on this CD were all composed for Frank Reinecke and myself during the last 11 years. It is a very special feeling having them all collected, like bringing one's family together, close and distant: Some are already well aquainted, other have never met before.